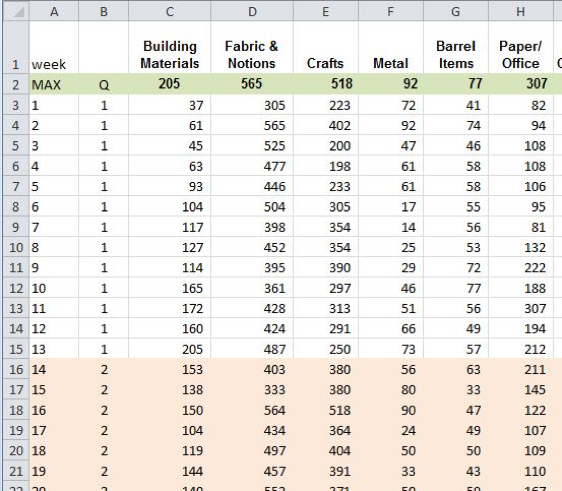 Welcome to the second installment of Technique Tuesday: Tracking Data Using Excel! 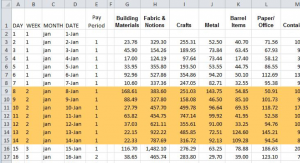 Last week we learned about conditional formatting, totals, daily average and average transaction amount. This week, Rebecca has focused on three different category totals that will be useful for tracking data and analysis. 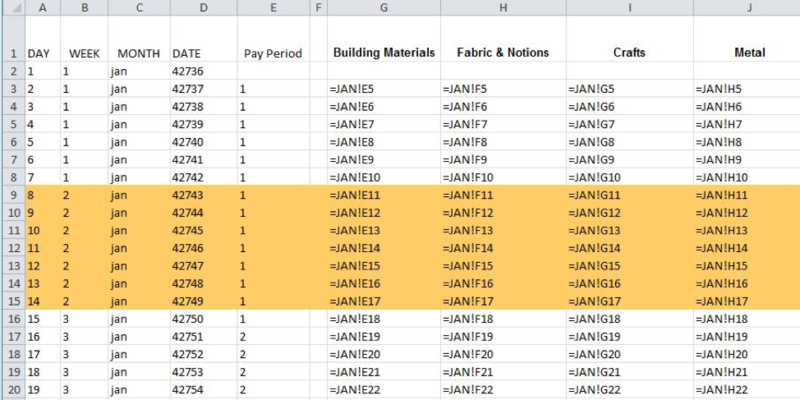 So that was how we’d been using Excel for a while, adding a little bit at a time, until 2015 when I took an Excel class as part of the Masters in Accounting (MAC) program that I was in at UNC’s Kenan-Flagler Business School. I was very excited to take that class. 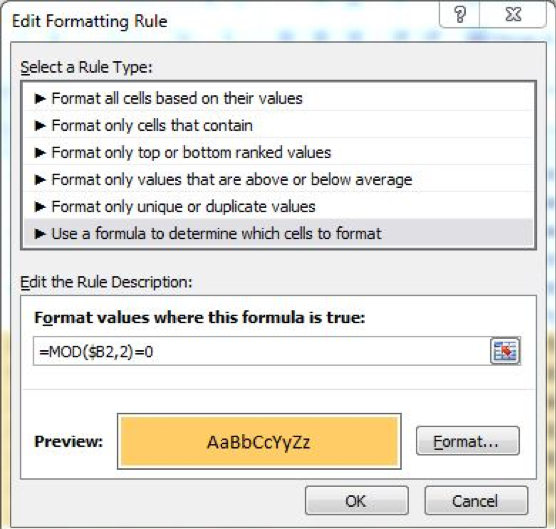 It did not quite meet my lofty expectations, but I did learn an extremely useful concept—I learned how to use the functions SUMIF and AVERAGEIF, which allow you to pull totals from an array of data without any further data entry. So we added three additional sheets to the end of our workbook: All Days, Weeks, and Average. These three sheets are simply grids with functions that display data from the regular month worksheets. 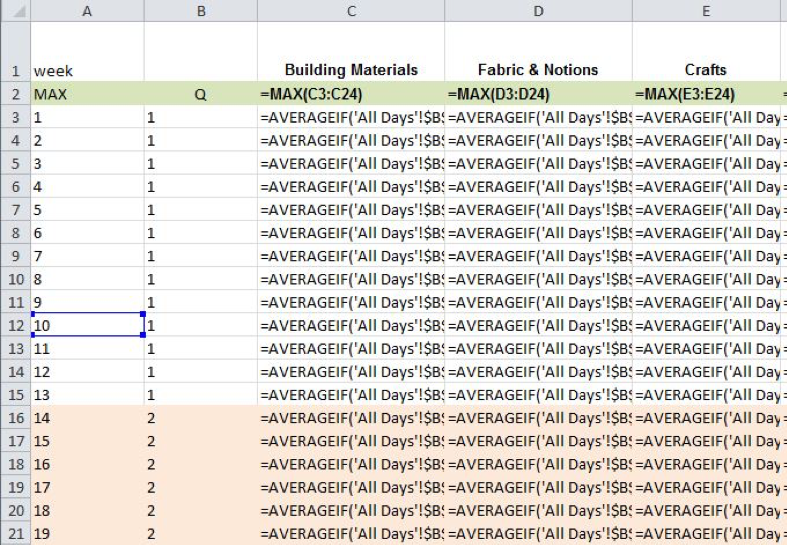 The All Days sheet doesn’t do anything by itself; it works in conjunction with the Weeks tab to give us the average daily average by week for each department. The Weeks worksheet has the same structure as the All Days worksheet, but instead of each day being a row, each week is a row; and instead of weeks being alternating bands of color, quarters are alternating bands. Stay tuned for part III coming next week!